This is the third and final article in the series from Sage Dynamics on Support Hand Only Handgun Skills. 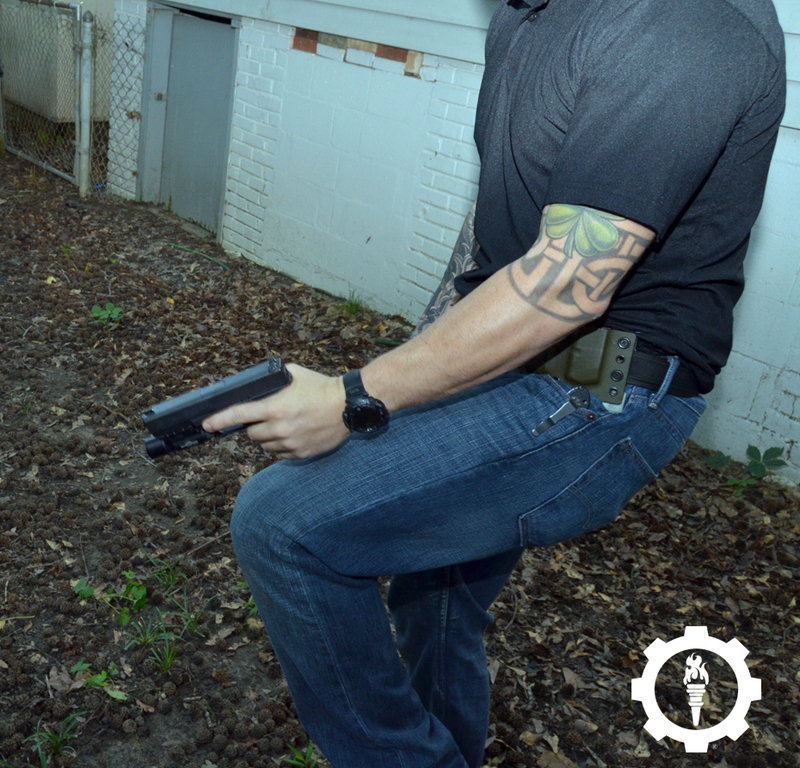 In this part Aaron Cowan explains how to best recover from a handgun malfunction. Using your support hand only to run the gun can be bad enough, factor in the need for reloading and it can get a bit more complicated. Now consider how much more complicated it can be if you have a malfunction. Pretty much as bad as it can get short of not having a weapon at all, right? How do you clear it? Short of a total equipment failure (such as a broken firing pin, trigger bar or other crucial part), there are two types of malfunctions you can experience with a handgun; Failure to fire and a double feed. Now lets look at how to clear them. An obvious sign of a failure to fire, a "dead trigger"
Failure to fire: Easily detected by the loudest sound in the world (the lack of a bang when you wanted one) which immediately follows a trigger press and lack of recoil, the failure to fire is either a lack of a loaded chamber or an ammunition related malfunction. This is by far the most common malfunction and the easiest to fix. Tap the magazine to ensure its seated, rack the slide to the rear and release it forcefully to eject a bad round and/or load a fresh round into the chamber and then re-assess your threat. Even one handed, performing an immediate action drill to put the handgun back into service is not terribly difficult. 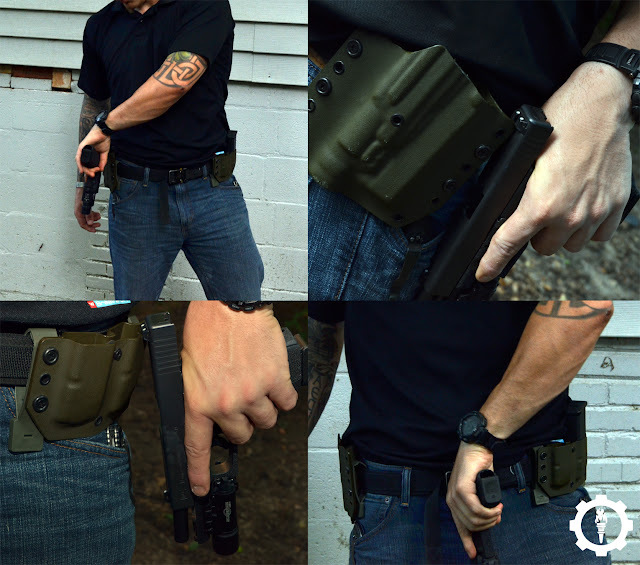 The magazine base can be struck forcefully against any hard object (holster, belt buckle, magazine pouch or your chest/thigh) and then the slide racked in the methods we have already discussed in part 2 of this series (photo refreshers below). Double Feed: A double feed occurs when a round in the chamber fails to extract and a second round is stripped from the magazine and pushed in behind the loaded round, causing a total stoppage. Short of running out of ammunition or having an equipment failure, this is about as bad as it can get. However, its fixable and may be easier than you think. As most shooters are primarily right handed and will be clearing this malfunction with their left (support) hand, it is a bit more difficult than if the malfunction was being cleared with your right hand. The first step in clearing this malfunction is critical to master. Handguns come in many shapes and sizes (and designs) all we care about in regards to this procedure is the slide lock/release and how easy it will be to manipulate it with your support hand. If your weapon is equipped with an ambidextrous release, you pretty much have an easier go at it. 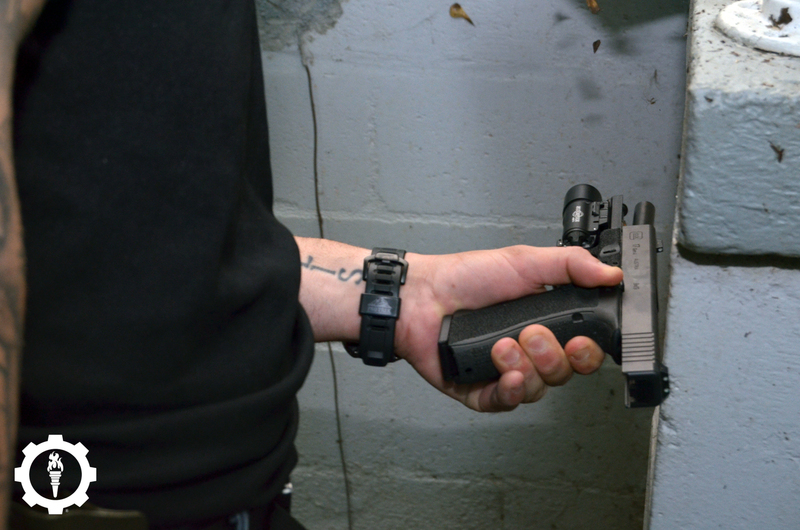 For those handguns with right-side-only releases and especially handguns such as the Glock that have slide locks and not releases (smaller surface area on the lever), it is a bit more complicated and requires more hand dexterity to clear the weapon. The first step is to lock the slide to the rear in order to relive the pressure on the round attempting to load in behind the loaded chamber. This is done by locking the slide to the rear. If you do not have an ambidextrous slide lock/release, you must leverage the rear sights (or front of the slide) against a hard object and apply stiff rearward pressure until you can lock the slide to the rear using your index (trigger) finger. 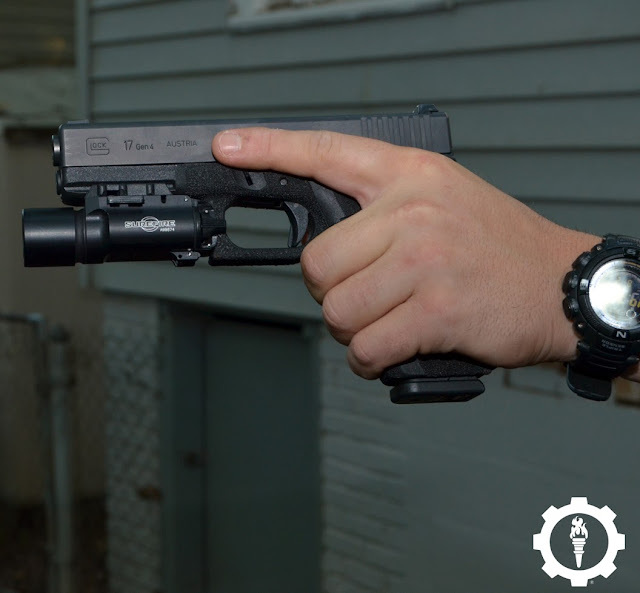 Useful for handguns with a smaller slide release/lock such as the Glock, you can roll the weapon in your hand and use your thumb to apply stiff upward pressure on the slide lock while leveraging the sights or muzzle to push the slide to the rear and lock it back. This method requires significantly more control of the weapon as the competing pressures coupled with the way you must hold the weapon can cause it to slip in your grasp. Practice this method often if you intend/have to use it. 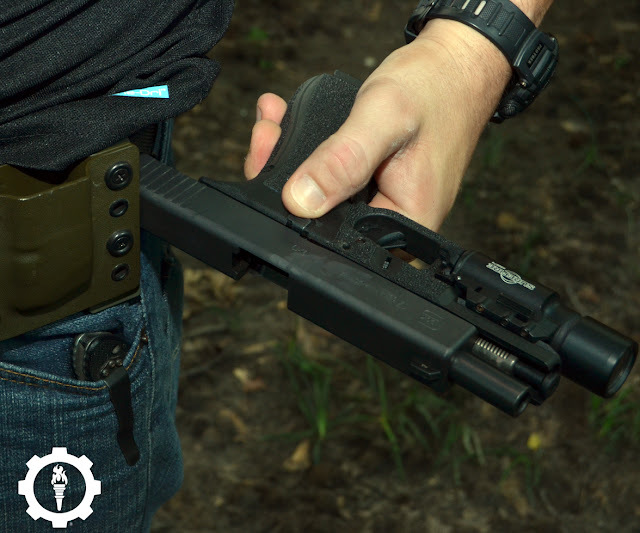 Once the slide is locked to the rear, the magazine is stripped while the handgun is secured in a reloading location (holster, belt line, on the deck, under your arm, etc). More resistance may be offered by the magazine due to the top round being pressed towards the chamber but a strong pull will free it easily. Once the magazine is stripped, rack the slide to clear the chamber (unless you can be absolutely sure the chamber was cleared when you stripped the magazine, which can and does happen) and then perform a traditional reload. With a fresh magazine in, rack the slide and re-assess your threat. Unlike drawing th weapon, reloading or performing an immediate action (tap-rack) drill, the nature of the double feed malfunction doesn’t leave much room for “outside-the-box” thinking. 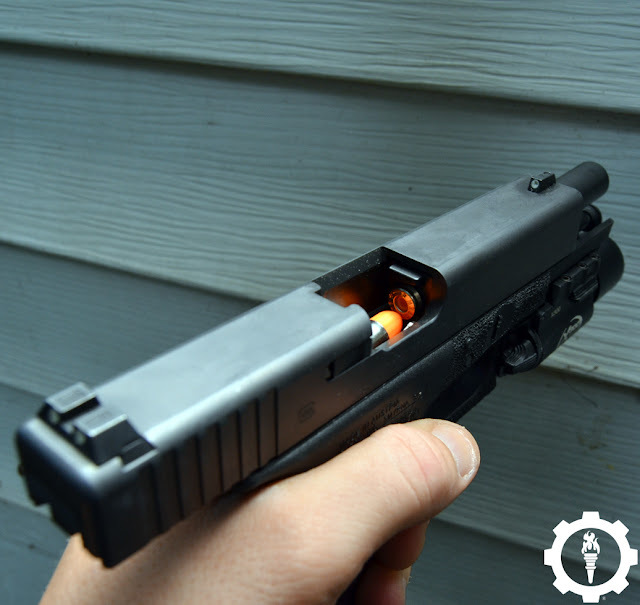 Some may attempt to strip the magazine before locking the slide to the rear and on some handguns this may be possible, however if you attempt this method and find that its not a 100% reliable method, rely instead on locking the slide to the rear first to save precious time. With sufficient practice (and skill maintenance), all of the skills we have looked at; the draw, reloading and clearing malfunctions can be mastered in a short period of time. Working them into your regular practice plan will ensure you remain proficient as these skills may just save your life. Train accordingly. Aaron Cowan is the Lead Instructor for Sage Dynamics, a reality-focused firearms and tactics training company that provides practical instruction from the fundamentals to advanced skills for the civilian, police and military professional. Aaron served in the US Army as an Infantryman, as a private security contractor overseas and as a police officer. In addition to patrol he worked as a a SWAT team member, SWAT deputy team commander, SWAT sniper, sniper section leader and in-service police training officer. Aaron holds multiple professional certifications including the National Rifle Association Law Enforcement Division’s instructor training program, California POST certified academy instructor, Advanced Law Enforcement Rapid Response Training (ALERRT) Active Shooter Response Instructor and Simunitions Scenario Instructor among others. When he isn't teaching or training, hes writes semi-regular for Recoil (web) and Breach Bang Clear among others."